New staff members at the Marlborough Multiple Sclerosis and Parkinson's Society Janie Miller, left, and Janine Ready with Society president Jane Heywood, right. 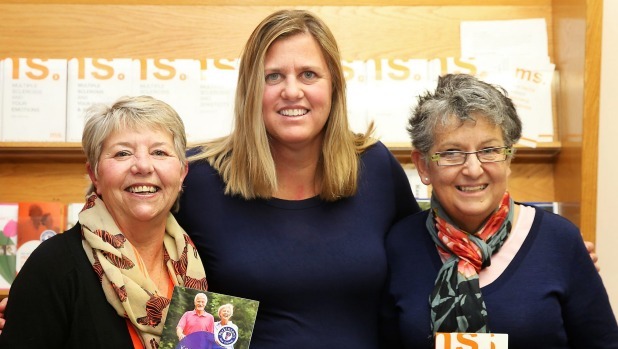 The Marlborough Multiple Sclerosis and Parkinson's Society has two new staff members. Administrator Janie Miller started in a 10-hour per week position at the society in March, while community educator Janine Ready picked up her 20-hour per week role in April. Marlborough Multiple Sclerosis and Parkinson's Society president Jane Heywood said the new positions had resulted in an improved service for the people of Marlborough. Ready was a registered nurse who provided home visits, advocacy, advice, and referrals. "We wanted to become more involved with other health professionals so we could provide a more cohesive service," Heywood said. "We've seen such a difference since [Ready] arrived. She's very engaging with all the clients." Multiple sclerosis is a disease of the central nervous system. Parkinson's is a progressive neurodegenerative condition. It was important to have good support available for people who had been diagnosed with multiple sclerosis or Parkinson's disease, Heywood said. "When people are diagnosed with this illness they often feel very isolated. They might not have anyone to talk to and they don't know what's going to happen next." The group also provided support to carers, Heywood said.